-or a section for "travel advisories" that are valid for a finite time period, for instance Athens during the Olympics, or Amsterdam from now until the estimated subway system completion date. Can the wiki be set up to automatically remove or archive expired travel avisories (for convenience and clarity)? 1 Link to Virtual travel through Amsterdam? 10 What about the touristic card "I amsterdam"? 19 I don't 'feel' this article. Link to Virtual travel through Amsterdam? What you think about a link to this page? It shows Amsterdam on Google-Maps, with user-selected photos from the highlights of Amsterdam projected on map. It is perfect for a virtual tour through the city. They're one of A-Dam's biggest draws and certainly a popular pass-time among many tourists. I don't know if it's okay to put 'welldones' on the talk pages, but I don't know where else to say it! This page is fantastic, very informative, exactly what a good guide should be. Thankyou! Maybe some Wikitraveler passing through Amsterdam could check this out. I don't know if it should get its own article here or just a long paragraph in the Get Out section, as usual it depends on having places to sleep. Is the strippenkaart really allowed to use for the NS trains in Amsterdam??? There are not many trains within Amsterdam... and I also never heard of this before. The NS website doesn't mention this. It's only on some routes (complements the metro system), There is a page on the NS site (Dutch) listing the line sections for Amsterdam and other cities.. Go to www.ns.nl, choose 'nederland' at the top, Then 'Kaartjes' in the blue horizontal navbar. Now in the yellow navbar on ther left choose 'Kaartsooten' and then 'Speciale treinkaartjes'. Scroll down through the list in the main page and select 'Strippenkaart en Sterabonnement'. Easy..not! The URL I see is: http://www.ns.nl/serhvlet/Satellite?cid=1076057854926&pagename=www.ns.nl%2FArtikel%2FOverig_www.ns.nl&p=1075382368841&lang=nl&c=Artikel but I have no confidence that this will continue to work. Hello all, I live close to the RAI Congress Centre and Schiphol, in the south of Amsterdam. The usage of trains is only valid here in Amsterdam, and maybe in the other great cities as well. The Hague, Utrecht, Rotterdam. The zonerule sounds good enough to try it out anywhere. The thing here in Amsterdam is, the strippenkaart is NOT VALID from September 2009, for the use of a chipcard will be the only valid transportation payment, habitants can choose to take one with their own identity and usefull for other information as well. But it will also be possible to use an anonimous prepaid card. HOW TO use this new card. 1.Hold the card in front of the reader and slice it gently. 2. Walk through the opening gates. This far quite simple.. though watch it, a lot of people, say 10% forgets to chip out.. Probably getting out is swifter than getting in. So do not forget. After leaving your destination, slice the reader as subtle again, and the trip expenses will be taken of the card. In Rotterdam this has been going on for a while, and the test is going to be nationwide now. So in the long run, you need only this card, to travel any public form of transportation, if it is the ferry, train, metro, trolly(arhnem), bus, interliners(regional bus transport) or trams, all on one card. The other uses of this card are non familiar with me uhmm http://www.ov-chipkaart.nl/ if you have a digital photo, you can sent it to have a personal pass, might be a new legal identification. Now only driving-license and passport are approved. It looks a bit weird if an article talks about something and then suddenly contains a statement stating that the preceding or following sentence is not right in some way. If you feel you know better then just go ahead and change the text. They don't "claim to" do this honestly and responsibly anywhere, they just do. I've seen other shops sellling products which can be seriously toxic, like the MAO inhibitors mentioned above, firstly without knowing what the hell they were talking about and secondly without any kind of warning. In CD I've seen irresponsible first-timers return completely distraught because they're under the influence and being taken care of, I'm certain any other shop would send them away and tell them to go to a hospital. What about the touristic card "I amsterdam"? Hotel website easytobook . com frequently abuses the hotel section for linkspamming. I have just removed their links to the krasnapolsky and Victoria hotel. Why no information regarding camping in the Amsterdam area? You don't want to camp there. There's nowhere for it. Why is there no section for coffeeshops as there is for places to drink and eat. Would that screw up the overall format? I have added Kam Yin Restaurant because I have been there yesterday. On a separate note(different user, not sure if I should have started a separate category here), I removed the erroneous statement "Also note that smoking cannabis is regulated under the non-smoking act, meaning that it is allowed only in a closed area where no personnel is working." only to find that it had been restored. I once again deleted it and provided an explanation since it is a fairly confusing issue. It's always seemed to me Amsterdam deserves the 'Huge City' status. Useless might be a bit rough on the city ;) The main thing is that we should be covering all areas of the city (since the basic Wikitravel philosophy is that we shouldn't have gaps in our coverage of the world). If South & West are worth covering, perhaps it would make sense to group them in the Outlying areas article? That way, content on those areas, which probably will only appeal to either long-term and adventurous travelers, or to travelers staying there for some reason (family, dormitories, etc. ), will be easily available, and won't bog down the Central article, and waste the time of the average traveler who only wants to see that area? Three districts for a city of 1.25 million doesn't sound like it would spread content too thin, and if we get more info, we could consider subdividing further. Old Center. Obviously the most important part of Amsterdam. 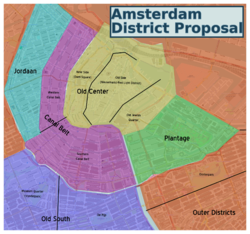 If it's too big, we could also divide this district by the black line I drew, which would form the districts New Side (Dam Square) and Old Side (Nieuwmarkt-Red Light District). Canal Belt. The Dutch call this area the Grachtengordel, maybe we could use that name, or we could call it the Canal Ring. Anyway, it's an easy-defined district, as the very-rich live here. As the black line on the map shows, it could be divided into a Western Canal Belt and a Southern Canal Belt, but I don't think that's necessary really. Jordaan. Again, a logical district and very well-known. Used to be a very poor area, but a lot of gentrification happened in the area and now it's quite hip (a bit like The Village in Manhattan). Plantage. A bit less-interesting neighborhood, but should definitely be there. I'd like some comments whether the Old Jewish Quarter should be added to this, or if that area should stay in the Old Center. Also the Oosterpark could be added to it to form Plantage-Oosterpark, but culturally/historically that wouldn't make sense. That would only be for the sake of adding the Tropenmuseum and Oosterpark as they're a bit popular. Old South. This is a combined district. The Museum Quarter is a rich area with the Vondelpark and PC Hooftstraat, while "De Pijp" is a typical folk lower-class area. They together form the official Old South political district. They can also be 2 separate districts, but I don't want too many districts for Amsterdam, thats why I think they can be combined. The name is hard. Old South is a bit bland, maybe Museum Quarter-De Pijp? Problem is that a part of the neighborhoods I want to include are actually called "New South", but the general term "South" covers a whole wider area, so that doesn't work either. Outer districts. The rest of Amsterdam, including North, New West, Old West, Westpoort, Zuideramstel, East, Zeeburg and South East. I agree it's hard to write an article like that. But the IJ is a pretty bad marking line as most of the outer districts are south of IJ. That's why I made an Amsterdam Proposal 2, see the map on the right. North, West and East-South East all broken down into separate districts. North is divided into Urban North (west of black line) and Rural North (east of black line), I guess we can combine them, though their character is strikingly different. West is a huge area, but the large New West area should be avoided. The other neighborhoods can be interesting though, but still for adventurous travellers. East-South East is the one I'm least happy with.. South East generally should be avoided (except for the center around Amsterdam ArenA and Heineken Music Hall, which is a good area), East is interesting for adventurous travellers around the Oosterpark. Yet, I'm not really happy with combining these areas, as they are physically separate and quite different too. But making a specific South East article also doesn't seem rewarding, generally there's not that much to do there and most of it is best avoided. It's a tough question. To clarify, in what article would the area between East and Southeast be covered, given that it is not part of the municipality? As for joining the islands of Plantage-Oosterpark, I think that is perfectly fine. I think many huge cities span multiple municipalities, The Copenhagen guide spans almost 20. Travellers don't really care about municipal borders I would venture. OK, I again changed the districts map. After all I think it's impossible to create less than 5 articles for Amsterdam's suburbs (South, West, North, East and Southeast). South clearly deserves an article, it's one of the most-visited areas of Amsterdam. West is all west of it, while North is all north of river IJ. Then we got East and Southeast, both which require a separate article as they are physically separated. It seems like overkill maybe, but I don't see how else we could split up the suburbs. This most visited area can be divided in the New Side, with it's traditional architecture, canal tours, Dam Square and shopping, as well as the Old Side with Nieuwmarkt, Chinatown and Red Light District. Also includes the Old Jewish Quarter with Waterloo Square. Probably the wealthiest neighborhood with plenty of Dutch celebrities living here. Also includes Rembrandt Square and Leiden Square, the city's main nightlife areas. Traditionally a working class area, now it's an expensive and hip district with plenty of art galleries, boutiques and restaurants. Also includes the Haarlemmer Neighborhood at the north side. Supposed to be an extension of the Grachtengordel, lack of demand made this into a leafy area with lots of greenery, botanical gardens and Artis Zoo. A trip to Amsterdam is not complete without a visit to the Museum Quarter. This district also covers the Vondelpark, De Pijp (with it's street market) and the South Axis, a rapidly developing business district similar to La Defense in Paris. A vast suburban area which can be divided in Old West, built in the 19th century, and New West, a multicultural off-the-beaten track area built after World War II. Also includes the Western Islands. Directly north of the center lies North, a newly-built suburb. Also includes the area east of that, the Rural North, a protected polder area similar to the Waterland and Zaan Region. Starting from the Oosterpark, this area includes all of the Eastern Islands, Eastern Docklands, Zeeburg and the rest of the Eastern suburbs. An exclave of Amsterdam, separated from the rest of the city by Diemen and Duivendrecht, the Bijlmer was forseen as a town of the future for upper-middle class families. It turned into a lower-class residential district home to people of over 150 nationalities, often associated with crime and robberies. It has improved remarkably the last years, but it still is an area only for adventurous travelers (and football fans). I agree it's a bit weird. 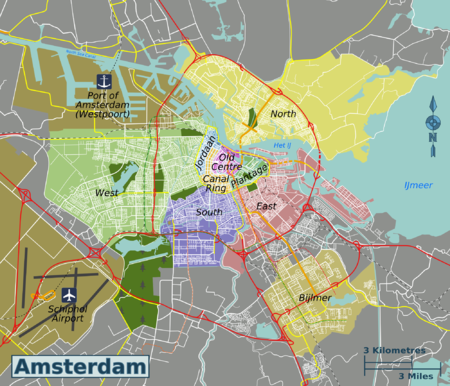 The Western Islands are actually a part of Centrum, so we could include them in Jordaan. I do think Grachtengordel and Jordaan should be separate — the Jordaan traditionally is a working class area, while the Grachtengordel is probably the wealthiest neighborhood of the Netherlands. Sure, Jordaan has gentrified, but it still is very different in nature. I don't 'feel' this article. This page was last edited on 4 September 2015, at 17:11.